The rivers and ponds are hard frozen now, and it’s time for the first brutal storms of winter. As we batten down for six months of harsh weather, we pause in thanksgiving for your kindness. You have seen us through especially difficult times this year, and it is only because of you that our mission signal continues to beam strong. It is your generosity and your prayers which sustain our work, as we labor hard to bring inspiration, education and positive companionship to the people who live in distant and isolated places. We thank you, we honor you and we pray for you. Thank you! DREDGING: (left) If you travel to Nome, one of the landmarks you’ll see is Swanberg’s Dredge, about a mile east of town. It ceased operating about sixty years ago, but is maintained by the city for tourists. KNOM volunteer music director Laura Davis poses by the gold dredge on one of the last days of autumn before the onset of the long winter. FREQUENTLY SPOTTED: Since KNOM’s first broadcast in 1971, the signal has been immensely popular, filled with popular music and news to attract a wide audience. In addition to the Mass and Rosary, KNOM sprinkles spots, like commercials, throughout its programming. Half are educational, half are inspirational. Throughout the year, the station airs approximately 68,000 of these spots. They are frequent, brief and effective, and they are a gift to our audience from you. NEXT MONTH: We hope to provide you a picture of KNOM’s 17th Gabriel Radio Station of the Year Award! The oldest Catholic radio station in the United States — effective and strong, thanks to you. INSPIRATIONAL SPOT: Lord God, Our Creator, help me to create, too. Create peace by my forgiveness. Create understanding by my being open-minded. Create hope by my gentle caring. Create love by generously serving others. INSPIRATIONAL SPOT: Right this moment, take that worry that is eating away at you like a rapidly growing cancer and turn it over to God. Refuse to brood over it any longer. Toss out doubt and fear and leave it all to God. MEET LAURELI KINNEEN (left), KNOM’s new public affairs director, responsible for daily news interviews and features. Laureli was raised in the town of Unalakleet (YOO-nah-lah-kleet), 150 miles southeast of Nome. Nine years ago, she married and moved to Nome, where her husband Fen is a pilot for Bering Air, a bush airline. The couple are raising two children. Laureli listened to KNOM from her family’s summer fish camp while growing up. 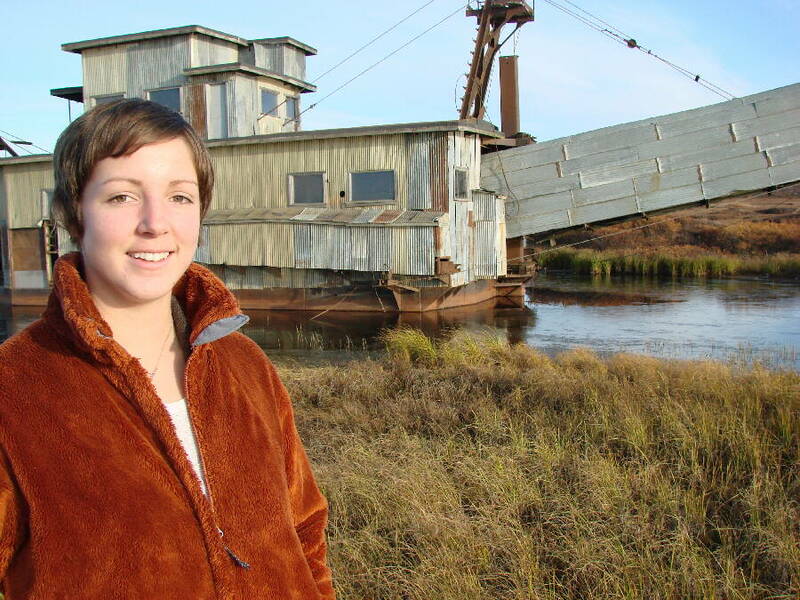 She and Fen are building a home a handful of miles north of Nome, where telephone and cable television service are not available, “and our main source of information and weather is KNOM,” she says. She brings to the station tremendous knowledge about the region and its people, and says that she’s looking forward to learning even more. SPEAKING OF BERING AIR: We once more thank this excellent airline. For more than twenty years, Bering Air has donated all village travel for KNOM staff. Throughout the years, their total contribution exceeds $100,000, and it’s thanks to them that our mission can send staff to places like Wales, as we reported to you last month. Please join us in praying for everyone involved with this wonderful air carrier. IRA: The recent economic bailout bill included a provision that exempts from taxable income all funds rolled over from IRA accounts to a charitable organization until December 31, 2009. To take advantage of this, a donor must be 70-1/2 years or older, annual gifts are limited to $100,000 and the contribution must be made directly to the charity. Are you in a position to take advantage of this option? WILL DO: Please consider adding our mission to your will. We prayerfully place all such gifts into funds that protect the mission from future emergencies and provide for major improvements. For most of us, these gifts will be the greatest of our lives and will help far into the future. INSPIRATIONAL SPOT: “God has created me,” Cardinal Newman wrote, “to do Him some definite service: He has committed some work to me which He has not committed to any other. I have a mission; if I am in sickness, my sickness will serve Him; in perplexity, my perplexity will serve Him, if I am in sorrow, my sorrow will serve Him. (Left) Just ahead of winter’s first snowfall in October, the KNOM transmitter stands tall on the shore of the Bering Sea, on windswept tundra three miles east of Nome. The building at left houses KNOM's emergency generator, which saw about seven days of full-time use last winter. 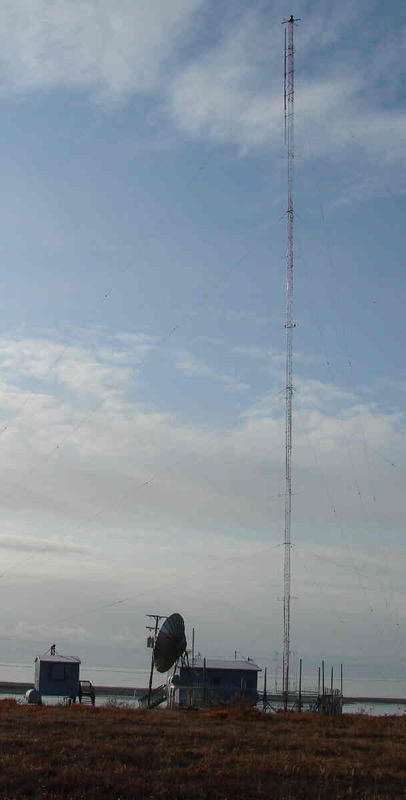 At the base of the tower is the building which contains the mission's 25,000 Watt AM transmitter. By mid-November, the ground will be white and remain so until May. 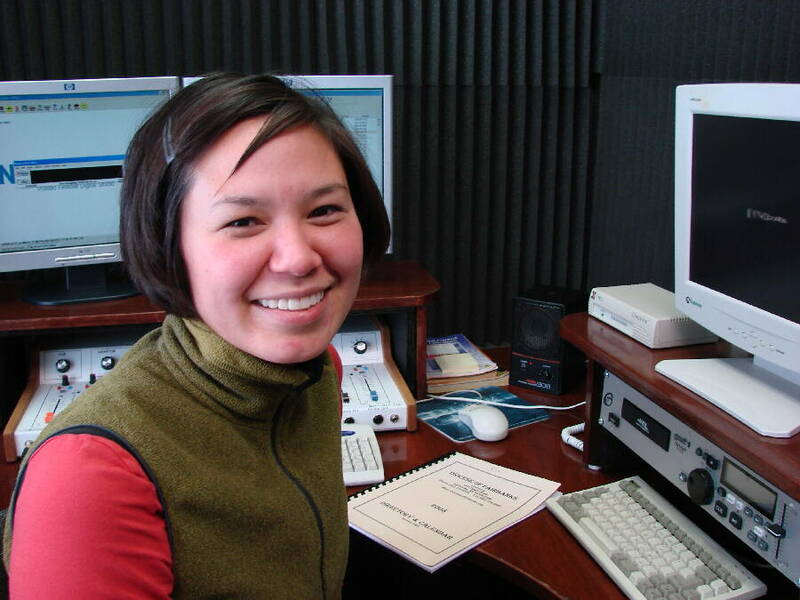 WHY KNOM IS ON THE AIR: Our mission exists to bring Catholic worship, ideals, education, information and companionship into far-flung Eskimo and Indian homes throughout western Alaska, to educate, inform and encourage village listeners, and to help them address the many social problems of the region. It is a remote, road-less, impoverished region. When you adjust for the cost of living (more than double the Lower 48), over half of families live in poverty. Only 6% of its inhabitants have achieved a college degree. Life expectancy is more than 7 years lower than the U.S. average. Suicide is over 4 times the U.S. average. The good news is that, as horrifying as these numbers appear, they are slowly improving, and KNOM is one element of that improvement. Like the Christophers, we are obliged to press into the darkness with a candle, to work as tirelessly as we can to chip away at the root causes of these tragic problems, and at the same time bring prayer and hope into thousands of homes. For the Catholic Church, serving its rural Alaska flock is painfully difficult. Most village parishes enjoy the celebration of Mass by a priest less than one Sunday a month, and among our services, KNOM gives them the opportunity to worship via radio. If you’ve been with us for a while, you’re familiar with the many important ways we serve the people of this isolated 100,000 square mile region. If you’re new to us, we invite you to stay tuned! INSPIRATIONAL SPOT: Only when I surrender myself into His Hands will God be able to do great things in me. 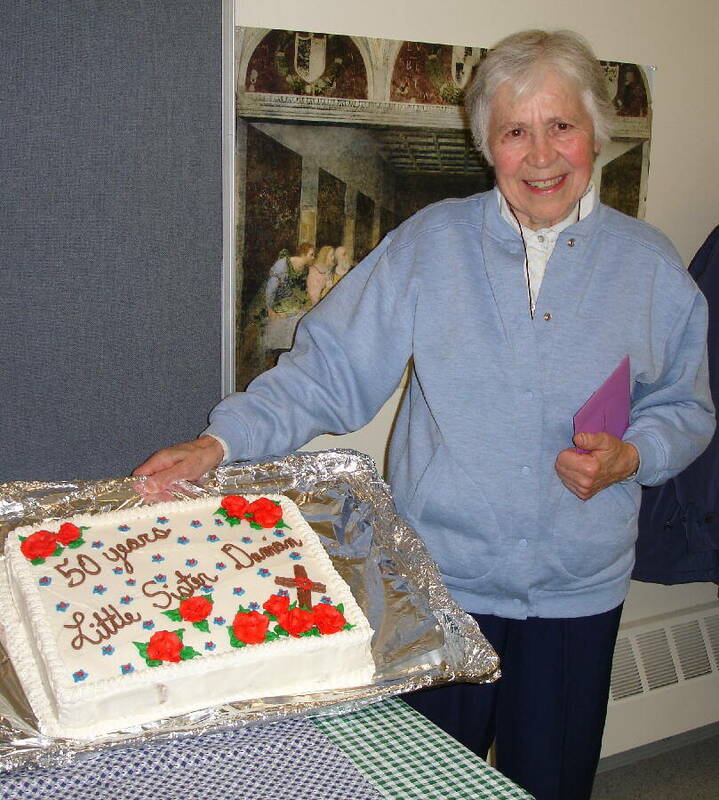 SHE TAKES THE CAKE: (left) Little Sister Damien of the Little Sisters of Jesus celebrates the 50th anniversary of her vows. The Little Sisters are a contemplative order, dedicated to living simply among ordinary people around the world, especially the poor. Sister Damien has spent most of her life in Nome, as well as Little Diomede Island. 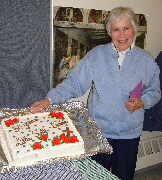 One way or another, she has inspired those who know her many times, including two generations of KNOM staff. “I was preparing to lead a Sunday lay presider service,” KNOM financial officer Tom Busch says, “and I came upon Sister Damien praying before the Blessed Sacrament. While none of us can expect to achieve a fraction of Sister Damien’s spirituality, we do see parallels between her order and KNOM. Like the Little Sisters, KNOM reaches directly into homes. We provide companionship and example throughout the day, in people’s kitchens and their summer fish camps. Thank you for making our work possible! THIRTY YEARS AGO: In November, 1978, KNOM is seven years old. In order to keep listeners’ attention, most news programs are short. This month, however, the mission introduces “In Depth,” at 6:15 and 10:15 PM, 15 minutes in length, featuring interviews with newsmakers and leaders. It’s an instant hit, and enjoys an 18-year run before being updated as “KNOM Profiles” in the 9 AM and 6 PM hours. HOW CAN WE EVER THANK YOU for your support and your prayers? In turn, we pray every day that Our Heavenly Father blesses you and those you love abundantly. God be with you!